Combine cornmeal, flour, cayenne, paprika, salt, and pepper in a shallow dish and a whisk to thoroughly combine. Heat vegetable oil over medium heat in a 12″ cast iron skillet to 350° F. Line a plate with several layers of paper towels; set aside. Use a paper towel to blot the fish pieces dry, season on all sides with salt and freshly ground black pepper, then dredge them in the cornmeal mixture, being sure to cover all sides. 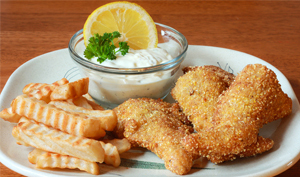 Tap fish pieces lightly to shake off excess. Remove fish from the pan with a slotted spatula to the paper-towel-lined plate to drain. While it’s still hot, season well with salt. Recipe provided courtesy of Chowhound.